Today’s guest post is from Richard, who runs The Broken Bullhorn. Richard is a very active blogger, offering discussions and reviews of new and older mysteries, science fiction, and graphic novels/comics. If you’re looking for a friendly blog that covers a wide range of genres and offers discussions in the comments, be sure to add The Broken Bullhorn to your feeds. 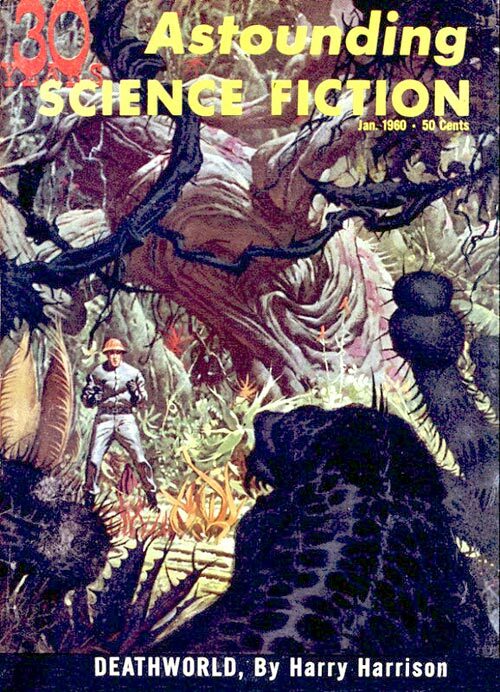 “Deathworld” is the name of a series of short science fiction novels by Harry Harrison including the books Deathworld (first published 1960, serialized in Astounding Science Fiction), Deathworld 2 (1964, initially titled The Ethical Engineer and serialized in Analog) and Deathworld 3 (1968, serialized in Analog as The Horse Barbarians), plus the short story “The Mothballed Spaceship” (written as part of a tribute to John W. Campbell). The central hero is Jason dinAult a gambler who becomes involved with colonists of an extremely hostile planet. Everything, on the planet, plant, insect and animal alike, is predatory, and capable of killing an unwary human instantly. All large animals are strong enough to destroy small vehicles. All small animals have neurotoxic venom. All plants are carnivorous, even if only by default—their victims fertilize their soil. All microorganisms consume insufficiently protected tissue as quickly as acids. After a futile attempt at acclimation, dinAlt decides it makes more sense to solve the planet’s mysteries instead of fighting the losing battle. This is wonderful classic science fiction. Available in affordable e-book format, it can be just a click away, and you’ll have a ton of enjoyment in return. Highly recommended! 6 Responses to "Talking About Harry Harrison’s Deathworld, a guest post from Richard"
The Deathworld books are terrific. I read them for the first time a handful of years ago. I like the character of Jason dinAlt, he is a fun Harrison character, who is just different enough from Jim diGriz that I feel like I’m reading a different series, which is what I wanted when I went into it. Pyrrus is a terrible place, I cannot imagine anyone choosing to stay there for any reason whatsoever. It would certainly make for an exciting film adaptation, as everything would be a potential source of danger. Carl, a nice coincidence that we both have Harrison books reviewed today, and good ones at that. Thanks to Red Reviewer for the opportunity to share DEATHWORLD with her blog readers. It is a fun coincidence, I’m happy that it happened. Great to see you guest blogging for Vintage SF month. Read all these back in the 60’s and 70’s. My best remembrance of Harrison is a short story called The Streets of Ashkalon. I picked this one up last year because it was a great 60s Penguin edition, and because it had a great paranoid-looking author photo (scanned at http://inthebrake.wordpress.com/2014/01/31/a-pair-of-sf-penguins/ ) — hadn’t been terribly interested in reading it, but now my interest is piqued. I think you’ll enjoy it, and it’s fast and easy old fashioned SF.